Leading hotel operator the InterContinental Group is introducing delivery robots at its Crowne Plaza San Jose-Silicon Valley property. The robots, made by local startup Savioke, will deliver snacks, toothbrushes and other amenities to guests in their rooms. The success of the new service, announced by the hotel group on Monday, will determine whether robot delivery will be introduced in other Crowne Plaza branded properties. The brand has almost 400 hotels in 65 locations. 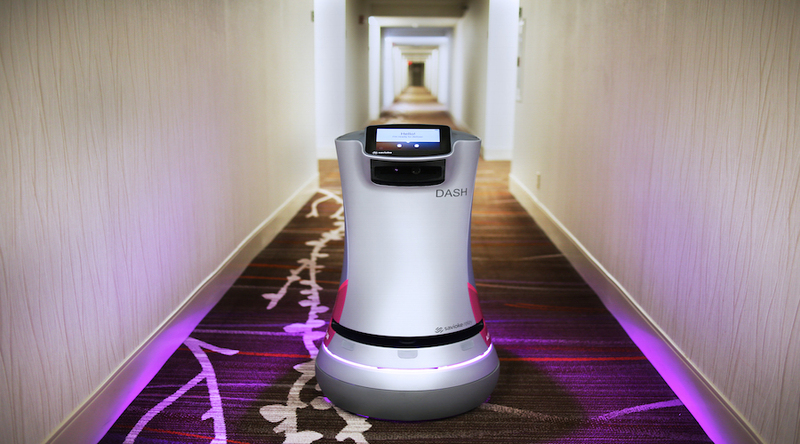 Named Dash, the Crowne Plaza’s new autonomous service has been created by Savioke, specialists in robot solutions for the hospitality industry. The system is based on the company’s latest autonomous service, Relay. Approximately 3-feet tall and weighing less than 100 pounds, Dash is designed to travel at a human walking pace, can independently navigate between floors and summon the hotel elevator using a wifi connection. Savioke unveiled its first delivery robot, SaviOne, almost a year ago and announced a new pilot scheme at the Aloft Hotel in Cupertino, California, which became the first major hotel brand to hire a robot for both front and back of house duties. Savioke’s new partnership with the InterContinental Group, will utilise the latest version of its autonomous delivery service featuring automatic docking, improved autonomy, and an all new design enabling Savioke to scale in response to demand. With its location in Milpitas, in the very centre of Silicon Valley, it’s apt that the Crowne Plaza Hotel is showcasing some of the cutting edge talent that is so associated with this part of the world. “Located in the heart of Silicon Valley, our hotel is making use of the best technology innovation that Silicon Valley has to offer,” said Crowne Plaza General Manager, Winnie Kwok.